if i am presdient movie. This movie does two things. It acts as a manual on how to run an election campaign for a non-politician and it reminds Nigerians of the importance of voting. From the beginning, it reminds you of the campaign rallies that would begin to flood digital and physical space. It also constantly reminds the viewers that the major problem of the country is the corrupt politicians and the people who stay silent. Ayoola Ayoola stars as Zinachi Ohams a 37-year-old presidential candidate of a new political party, the Nigerian Rebirth Party. NRP is made up of young idealists faced with the dangers and problems associated with getting involved in politics. He has to tackle a lot of problems associated with being a greenhorn in politics- How to raise funds, how to stick to your convictions, how to face and overcome danger even when politics literally makes you cry? Would Ohams withstand all the adversity to emerge victoriously? - This is the premise of the film. After ‘King Of Boys’, this is the second film that builds its story around the political clime of the country and exposes some of the underlying problems associated with politics. The acting, cinematography and music combine to provide the right atmosphere and tempo for the movie. The acting from Rahama Sadau who plays Ayoola’s wife in the movie touches the emotions and evokes sentiments. Meanwhile, Bimbo Manuel’s character is like Frank Underwood in the political drama ‘House Of Cards’. He breaks the fourth wall and speaks to the camera directly explaining how politicians distract the citizenry while they loot the country’s treasury. Bimbo Manuel's character helps drive the story along. Every violence in the film, every political rally, every protest, the influence of social media on elections and other matters being addressed in the movie might be a forecast of what Nigerians should expect in 2019. This film would definitely rouse this line of thought in anyone’s mind. 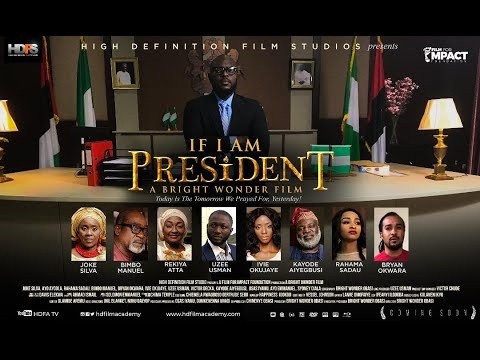 Even though some scenes could have been made tighter and the film a little shorter than 2hours, ‘If I Am President’ is recommended for every Nigerian to watch.